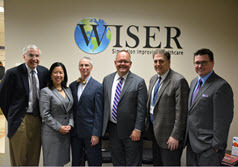 The second day of the 12th Annual Safar Symposium was held at WISER on Thursday, May 22nd, 2014. The focus of this year's simulation portion of the Safar Symposium was Simulation for Graduate Medical Education and Assessment. Physicians and educators discussed how simulation education plays a key role in the immersive learning environment for graduate students. Speakers explained how individuals use what they learned from the simulation environment in the hospital setting on a daily basis. "Training-Induced Bias: Beauty and the Beast"
"Simulation as a Research Tool: The Surgical Crisis Checklist"
"Incorporating Simulation into ACGME's Milestones Evaluation Process"
"You're Sure to Get Somewhere if You Only Walk Long Enough: The Changing Role of Debriefing in Simulation Education"
WISER would like to thank the presenters for their knowledge and insight into the evolving world of medical education and simulation.